The Racine Scouts have worked with Feeding America, the nation's leading domestic hunger-relief charity, for four years. On Thursday, July 8, the corps showed its appreciation by performing in an outdoor concert for the organization's staff at their Northeast Wisconsin branch headquarters in Milwaukee. 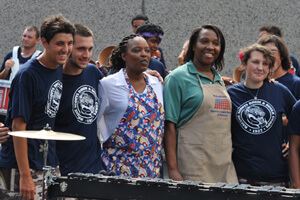 After playing music from their 2010 program, corps members enjoyed a cookout from Feeding America staff. "The staff and associates enjoyed the music, and the concert gave the corps members an opportunity to say 'Thank You!' to the organization that supplies a large part of the corps' food budget," said Corps Manager Andrea Birbilis. Formerly known as America's Second Harvest, the organization seeks to feed America's hungry by networking with food banks and engaging American citizens to fight hunger. According to the Feeding America website, more than 2.5 billion pounds of food and grocery products is distributed annually through a nationwide network of food banks. View a photo gallery from the Racine Scouts' performance. Learn more about Feeding America.